It is almost that time of year again – the joyous holiday season! It’s the time when Christmas decorations can be seen from miles away, stores are having ridiculous sales, people are sipping eggnog while listening to holiday music on repeat, and of course, Santa Claus is making another trip around the world delivering gifts to children. In Italy, according to an article from Focus Italia, Santa Claus comes from the historical figure of San Nicola, a bishop who lived in the 4th century. The story goes that San Nicola gave endowments to young girls in order to help them get married and thereby avoid the path to prostitution. During the Middle Ages, people commemorated this story of giving gifts to children on December 6th. 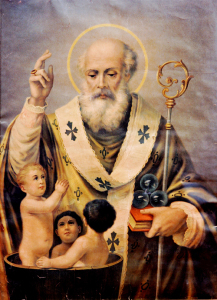 In Protestant countries, San Nicola lost his name and his status as a Catholic bishop his role as a giver remained. He was called Sinterclaus or Santa Claus. And the festivities that originally took place on December 6th were moved to another important date in December: Christmas. The notion of Santa Claus as a big jolly man with a white beard wearing red comes from a poem written in 1822 by the American writer Clement C. Moore. This image became popular in the 1950s not only in America but also in Europe. In Italy, this version of Santa Claus became known as Babbo Natale, or Father Christmas. To celebrate the upcoming holidays, Sentieri is having a “Festa di Natale”! Come join us at Anna Maria Pasteria on December 9th for a night filled with food, drinks, and fun! Sign up soon, as our deadline for the Christmas party is November 10th!